Very well positioned, with great facilities inside and around the property. You have a range of options to choose either walking or driving. The Mall (La Canada) is just 10 mins away driving and El Corte Ingles just 5 mins away if you walk. You have BP, SuperSol supermarket and few local restaurants and shops around if you don’t feel going further. Also Puerto Banus, for who is into fashio brands or yachts / sea view and beach bars, enjoying good food and drinks as well, is also just 10-15 mins away driving with lots of parking spaces around. Overall Guadalpin Suites is a great place to stay either you are visting, coming for business or spend some time away from big metropoles. Nice big Suite. Plenty of space and great terrace area. Easy location with free parking. A very good option for Marbella. Really nice terrace and jacuzzi. Friendly stuff. Easy check in and out. Amazing suite 2 rooms for family or friends to share. We needed a place to sleepover during our andalusian roadtrip, it was perfect location for us. The swimmingpool was spot on - we managed to relax a little. The person who cleaned our room put an extra care into it. She/he cleaned more than we expected. We had an excellent stay. The only bad thing was that we noticed some of the other guests found that their Jacuzzi did not work. Luckily our one worked perfectly and was thoroughly enjoyed! Size of Appartement and terrace are optimal. Staff are friendly and helpful. The Suites were very comfortable and very easy to locate. The check in was easy and it was nice to be able to walk to the promenade for dinner. Beds were great and bathroom very clean and spacious. Great stay! We booked the penthouse superior suite. It was amazing. 2 beds, 2 bathrooms, 2 floors of sun terraces, jacuzzi and amazing views. Very high standard. Lock in a great price for Guadalpin Suites – rated 8.2 by recent guests! 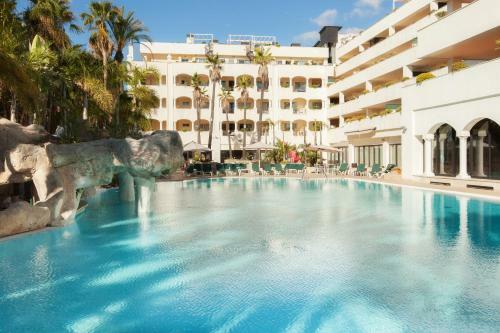 One of our top picks in Marbella.Offering luxurious studios and apartments with large terraces, Guadalpin Suites has an ideal setting just 1,800 feet from Marbella’s beaches. Set in attractive grounds, it features an seasonal outdoor swimming pool. 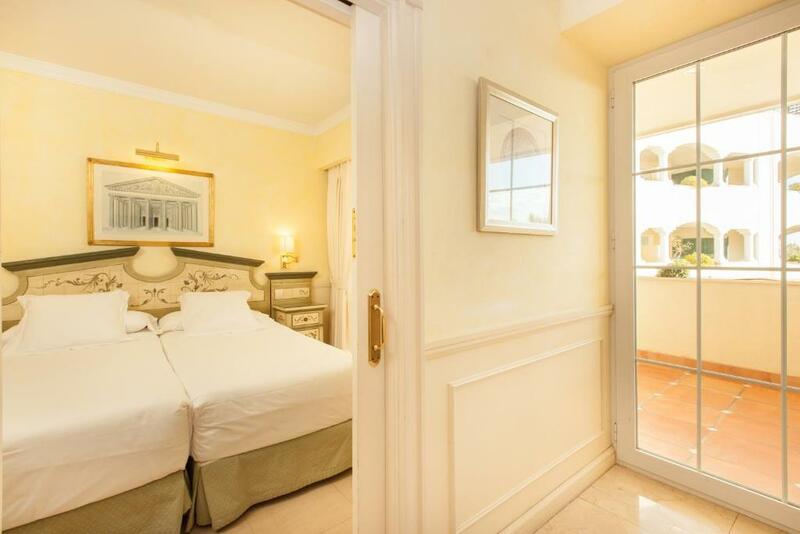 Each spacious, modern studio and apartment at Guadalpin Suites is decorated in pleasant cream tones. There is a seating area with a flat-screen TV. Kitchen facilities include a fridge, microwave, electric hob, dishwasher and a washing machine. Apartments include separate bedrooms, a living room with a larger TV, and a kitchen. Set on the Golden Mile between Marbella and Puerto Banús, the Guadalpin has easy access to the Costa del Sol’s beaches. It is within 3.7 mi of 3 golf courses. Málaga and Estepona can be reached in 35 minutes by car. Gibraltar and La Línea de la Concepción are around 47 mi away. When would you like to stay at Guadalpin Suites? Offering views of Marbella from its terrace, this spacious, modern studio is decorated in pleasant cream tones. There are either 2 single beds or a double bed and a flat-screen TV. Kitchenette facilities include a fridge, microwave, and electric stove. Extra beds are not available in this studio. Offering garden views from its terrace, this spacious, modern apartment is decorated in pleasant cream tones. There is a double or twin bedroom, and a living room with a sofa and a large flat-screen TV. Kitchen facilities include a fridge, microwave, electric stove, dishwasher and a washing machine. There is also a dining area. Featuring a terrace with views of Marbella, this spacious, modern apartment is decorated in pleasant cream tones. There is a double bedroom, a twin bedroom, and a living room with a sofa and a large flat-screen TV. Offering pool views from its terrace, this spacious, modern apartment is decorated in pleasant cream tones. There is a twin bedroom, 2 double bedrooms, and a living room with a sofa and a large flat-screen TV. Two Bedroom Suite Apartment Superior. Decorated in pleasant cream tones, this air-conditioned apartment features a private terrace with a spa tub and pool views. There is a double bedroom, a twin bedroom and a living room with a sofa and a large flat-screen TV. Kitchen facilities include a fridge, microwave, electric stove, dishwasher and a washing machine. Decorated in pleasant cream tones, this air-conditioned penthouse apartment has a private terrace with sea views, as well as a separate sun terrace with a hot tub overlooking the sea, the pool or the city. It features a double bedroom, a twin bedroom and a living room with a sofa and a large flat-screen TV. Kitchen facilities include a fridge, microwave, electric hob, dishwasher and a washing machine. There is also a dining room. Decorated in pleasant cream tones, this air-conditioned penthouse suite has a private terrace with a hot tub and stunning views of the sea, the pool or the city. It features a double bedroom and a living room with a sofa and a large flat-screen TV. Kitchen facilities include a fridge, microwave, electric hob, dishwasher and a washing machine. There is also a dining room. Featuring a private terrace with views of the sea and pool, this spacious, modern apartment is decorated in pleasant cream tones. It has 2 double bedrooms and one twin bedroom. The living area includes a sofa and a flat-screen TV, and the kitchen comes equipped with a fridge, microwave, ceramic stove, dishwasher, and a washing machine. There is also a dining area. Estimados huespedes, Muchas gracias por su confianza! Nuestro empeño por crear un conjunto vacacional que cubra las necesidades tanto de familias, parejas o personas que viajan por trabajo nos ha llevado a abrir Guadalpin Suites, alojamiento con una serie de servicios pero con la independencia que proporciona su propio apartamento. Una empresa joven, energica y con afan de superacion que cree en la importancia de un buen servicio, el trato personalizado y la satisfaccion de todos nuestros clientes. 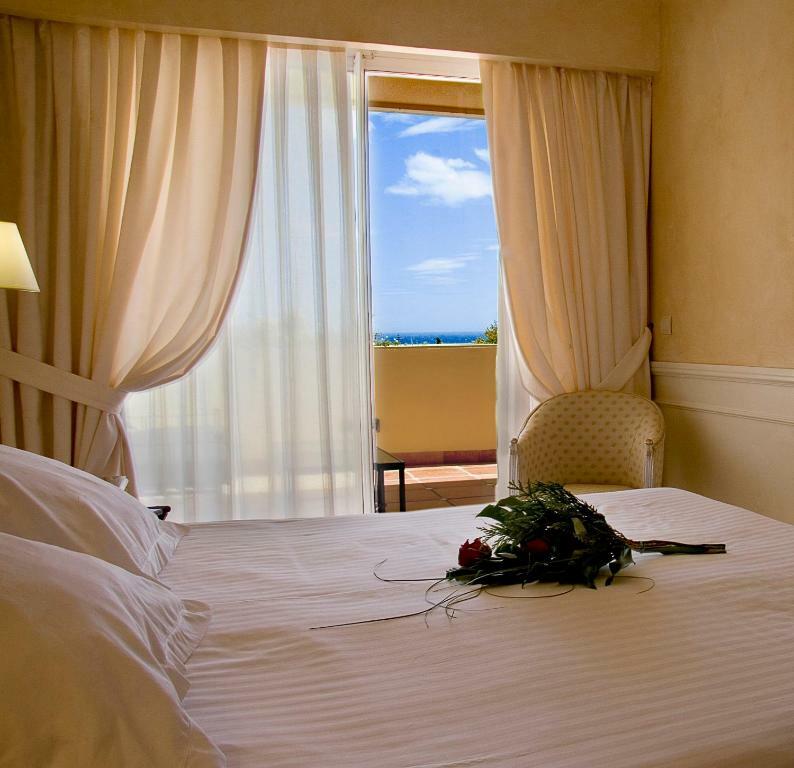 House Rules Guadalpin Suites takes special requests – add in the next step! Guadalpin Suites accepts these cards and reserves the right to temporarily hold an amount prior to arrival. Please note an extra bed is available in all apartments apart from the Studio. Please see Policies for applicable charges. Cleaning services are available until 18:00. Bed linen and towels are changed every 3 days. Extra change service is available for a surcharge. Please note that a refundable EUR 50 deposit is payable for use of the remote control to access the car park. Please note the credit card holder must be present at check-in. If it is not possible, a copy of the credit card and the ID for the credit card holder must be submitted. For stays of 28 days or more, cleaning, and towel and linen changes will be done once a week. For stays of 28 days or more, payment must be done via bank transfer. The property will contact guests with all the necessary details. For nonrefundable reservations, you must confirm your credit card details via a secure link. Guadalpin Suites will send you the link by email after you have made a reservation. Please note that Guadalpin Suites does not have a spa, fitness center, or any restaurants/bars. A damage deposit of EUR 200 will be blocked on your credit card and will be released subject to a damage inspection. If the guest does not have a credit card, the EUR 200 will be required in cash upon arrival for incidentals. This deposit is fully refundable upon check-out and subject to a damage inspection of the accommodations. Please note property might request payment via bank transfer. The property will contact you to provide bank details. Please note that the size of the different rooms in square yards include the surface of the terrace. Please inform Guadalpin Suites of your expected arrival time in advance. You can use the Special Requests box when booking, or contact the property directly using the contact details in your confirmation. No drinks or snack bar on site - however Lidl next door! Repeat customer, wouldn't repeat if I didn't like it. Fourth visit guess it says it all ;) whichever apartment you select they are all to the same high standards. Air conditioning wasn't working the first 2 nights, and we had already asked the reception to check it out, But eventually on our last night we had a peaceful sleep with it working. Room was dirty, old furniture, stained pillow cases and sheets , cobwebs on ceiling!!!! Overall apartment was very old fashioned and also seat cushions were stained also. We didn’t get new towels the whole 3 days we was staying there. Hot tub was the only good thing and balcony. My wife tried to check in while I parked the car but she was turned away by the security guard in the lobby because she did not have a paper copy of the booking. A beautiful apartment and well equipped. A short walk to the seafront.